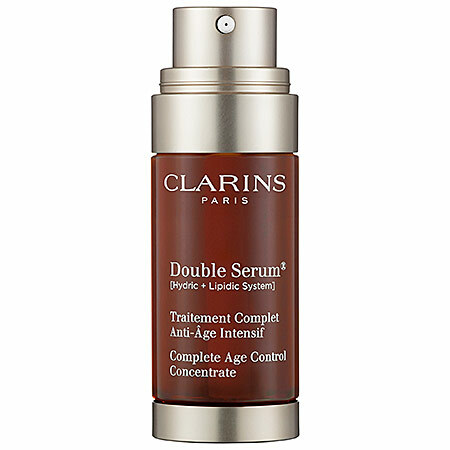 They say that some things in life can be a "double" edged sword - meaning a little good and a little bad will come from them, but in the case of Clarins Double Serum Complete Age Control Concentrate there's only one outcome - amazing, glowing, healthy skin. This serum has a dual chamber system which combines two formulas into one unique serum that firms skin , reduces wrinkles, produces a more even skin tone and minimizes pores. Sounds like an awful lot for one serum to do, but I'm happy to say that it really does deliver. The pump dispenser released an equal amount of serum from both chambers. I only used 1 pump morning and evening. The serum has a lovely light floral scent which dissipates quickly. I then blended the serums together and "pressed/patted" them only my face. The texture of the serums when it first hit my skin was ever so slightly oily, but it immediately absorbed into my skin after about a minute. It felt so soft and silky, and at the same time very lightweight. Clarins Double Serum provided moisture to my drier areas and a beautiful glow to my skin. After using Clarins Double Serum 2x day for just a few weeks I could see a significant improvement in the overall l texture and tone of my skin. My usually drier areas like my cheeks were baby soft and I has not irritation or clogged pores. I had a beautiful glow in the morning and the texture of my t zone was smooth and even. On most mornings, my skin looked good enough to just add a little primer (but no additional moisturizer) and then either tinted moisturizer or BB cream for added finish. I've continued on for another week and I'm still seeing great results. It's one of Clarins more pricey products, but it's very concentrated so a little will go a long way when making this great skin investment.